Sitting in an echo chamber you don’t hear much, but the little you do hear is amplified in the extreme. In social media the effect is similar: our own opinions are reflected back to us hundreds of times, thereby reinforcing them. Opposing voices are silenced by algorithms. This effect in social networks is named after a room which amplifies acoustics: echo chamber. Together with the sound artist Cathy van Eck, the adventurously experimental quartet DieOrdnungDerDinge search with their usual wit and humour, for connections and parallels between echo phenomena in acoustics, the media and music. DieOrdnungDerDinge draws on contemporary music, for the most part especially commissioned for EchoChamberMusic, in order to explore echo’s many facetted voice. The ensemble also explore the echo motives of Renaissance and Baroque music, which already hundreds of years ago used this phenomenon as inspiration for canons and fugues. Naturally the greek myth of Echo and Narcissus is also investigated and reinterpreted. 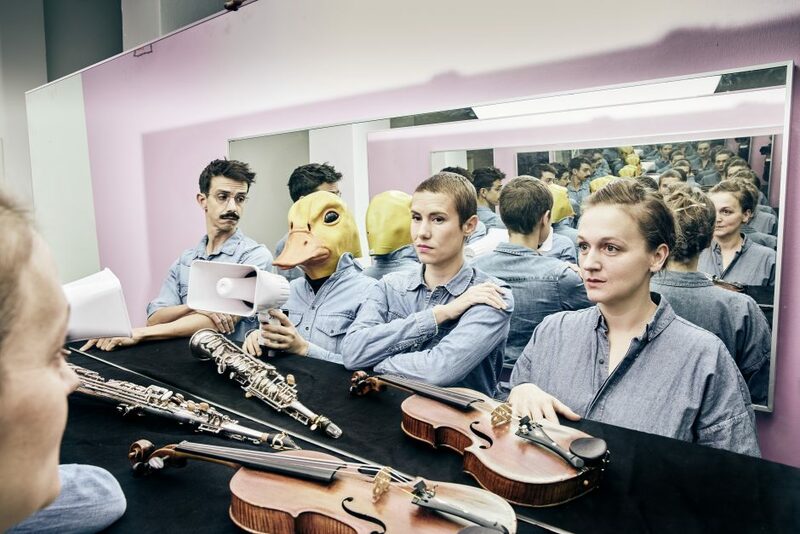 Founded in 2011 Ensemble DieOrdnungDerDinge specialise in the creation of a new repertoire where concert, performance and theatre meet. Together the four musicians develop original forms of performance, concert settings in which visual and theatrical elements play an essential part: musical and performative fantasy are equally important and concert and theatre staging combine. DieOrdnungDerDinge performs internationally in venues such as the Guggenheim Museum Bilbao, Zurich Schauspielhaus, Gare du Nord Basel, Haus der Kulturen der Welt Berlin and festivals such as Transparent Sound Festival in Budapest. is an acoustic translation of the echo chamber effect in social media, which will be returned to throughout the evening. She transforms the theatre space into a self-contained resonating chamber, which accumulates sounds, music and speech, in order to release them from different directions and locations at a later point as altered echos, providing a recurrent theme which binds all elements of the programme together. With the help of echolocation devices, which were originally developed for manoeuvring ships at sea, the blindfolded performers orientate themselves in the room like bats. The devices send out acoustic impulses which rebound from walls and other obstacles in the room creating an acoustic panorama of the space. Birdsong is played from a circle of twelve loudspeakers which the violinist imitates. Like Narcissus with his reflection in a pool, the violinist is increasingly confronted by reflections and echos of their own sounds from the loudspeakers. In the confusion of voices an uncertainty between original and imitation arises. This piece combines scenes from the British early colour film Black Narcissus with the last documented performance of the countertenor Klaus Nomi and his interpretation of Handel’s Cold Song. Place side by side the two films unfold, in an abstract associative manner, a multilayered game of symmetry and reflection, reflecting on the leitmotiv of Narcissus and Echo. is an audio-visual study on the functionality of a human construct: the network. Three musicians produce sounds with their hands and feet which are individually illuminated by a projection. Thus an audio and visual network and it’s lines of connection appear which is commented upon, analysed and influenced by an off-voice. Beginning with a tutorial on how to successfully use Instagram, Facebook or Twitter, a social media ex-pert opens a discussion on temporal and spacial “multiplicity”, which quickly develops into a rapid, ca-cophonous musical composition. The composed simultaneity of countless information, who’s hierarchies are constantly being reordered, reflects the daily experience of social media users. Funded by the Senatsverwaltung für Kultur und Europa and the Musikfonds with funds from the Beauftragten der Bundesregierung für Kultur und Medien. In cooperation with Theaterdiscounter Berlin.